The opening for the Earth and Fire Festival in Shelby, NC was last night and it was great fun. Saw lots of old pals and met new ones and some nice pieces went home with some really nice folks. The show will be up through July 25th. The interior of the gallery space is the old train depot, which is beside some very well travelled tracks. There were a few trains whizzing by last night at a pretty fast clip. I've always liked trains. My grandfather and uncle worked in the railroad industry and my biggest disappointment in 4th grade was the fact that our school field trip had to be cancelled. My class was supposed to ride the train from Bossier City to Oil City and we were supposed to be served Coca-Colas during the journey. Pretty simple expectations back then, huh? This is a set that I created as a functional piece for chip/dip or serving piece but was inspired to do a flower design. The sauce bowl holds hosta leaves and a Japanese maple branch in a flower pin frog. I can envision water in the basin with floating leaves or candles. Just love the hosta leaves--so much texture and form. This set (minus the arrangement) will be available at the Earth and Fire Pottery Fest, Kings Mountain Art Center, June 28 to July 25th. The joys and difficulties of customized orders. I took on these little oil containers thinking they would be simple. Even spent a lot of time carving them....against my better judgement that I should invest minimal time in them until I had worked out the kinks. I think there is hope but they do not pour like I had envisioned. And the little hole that was supposed to direct any drips back into the jar must not be positioned correctly yet. So back to the drawing board. My really big mistake was inserting the neck into the body without trimming it, so it acts like a collection point for liquid when the volume gets low. Hindsight being perfect I realized I had created a dam inside the piece. Others will be in the works to smooth out these issues. I am nothing if not dogged in finding a solution. 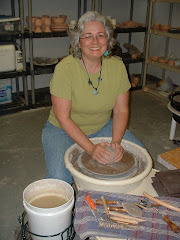 Just got the new promo materials for the Carolina Pottery Festival in Shelby on Nov. 8, 2014. Will be sending out to the participating potters very soon so they can hand out or mail to their pottery customers and friends. I really enjoy designing these pieces every year. I have watched different people's work blossom and change over the years of the festival and it is kind of like watching the growth of the individual as well. Featured on this year's cards are the works of Hal Dedmond, Hal Dedmond Pottery, Corine Guseman, Peace Pots Pottery, John and Donna King, Puzzle Creek Pottery, Ron Philbeck, Ron Philbeck Pottery, and Debbie and Randy Sells, Homeplace Pottery. When you develop new glazes, that means new images, so I have been working on some new shots featuring these little bowls. I love the way the texture reveals the glazes and they are just fun to work with. Recently sent a huge order of these to the Visitors Info Center in Charlotte.